Manager of network services, Newell Rubbermaid Inc.
To connect your devices, applications, and services, your organization relies on a range of core network services. These include Domain Name System (DNS), Dynamic Host Configuration Protocol (DHCP), IP address management (IPAM), Network Time Protocol (NTP), and Trivial File Transfer Protocol (TFTP), among others. Disruptions to these essential services can carry significant consequences, including losses in productivity, customers, sales, and revenues. If these services are inadequately secured, your network and data may be at risk from cyberthreats. In addition, as your business becomes more globally distributed, these services need to scale efficiently to keep pace. The patented Infoblox GridTM provides a unified platform for core network services that delivers the high availability, security, and management efficiency your business needs to flourish in today’s digitally-connected world. Based on a sophisticated distributed database technology, the Grid enables you to easily link diverse network appliances into a single, integrated system that’s highly responsive and simple to manage. Increase service uptime with the Grid. It automatically distributes and consolidates critical information and services in real-time with assured data integrity, including protocols (e.g., DNS, DHCP, FTP, and NTP), data (e.g., IPAM, mac addresses, and user credentials) and files (e.g., firmware images, configuration files, and policies). Distribution ensures availability when a key site goes down or connectivity is lost. It also eliminates manual synchronization that could result in errors or service disruption. The Grid comes with security baked in to its architecture. It protects against DDoS attacks and minimizes attack surfaces to prevent vulnerabilities from being exposed. It ensures data privacy and authenticity by using certificate-based authentication and SSL encryption in all communications among network devices, applications, and services. It also secures all data, including DNS zone data, during replication. Centralize maintenance of even thousands of far-flung devices. Simplify network management by automating tasks such as code updates and delegating permissions to different users. Enhance response times by enabling applications and devices to optimally connect to core network services. Keep track of the health state of various systems, ensure security, compliance, and audits with extensive monitoring and historical reporting capabilities. The Infoblox Grid can be deployed as a physical, virtual, or cloud-based network appliance. You can deploy it on premises, or as a virtual appliance, using a range of hypervisors, including ESXi, HyperV, KVM, and Xen. You can also deploy the Grid in the public cloud through Amazon Web Services (AWS) as an Amazon Machine Image (AMI). In addition, the Grid easily integrates with other systems to simplify and automate diverse IT processes through its assortment of RESTful APIs. 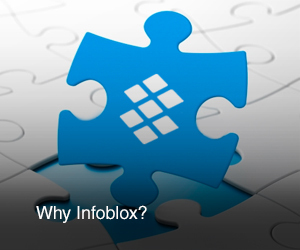 Infoblox offers its customers flexibility in licensing and pricing. Customers can purchase a perpetual license with our standard support options or an annual subscription license that includes support and upgrades. Customers are automatically eligible to receive software upgrades for the appliances, physical or virtual regardless of whether they are deployed in their own virtualized environment (like VMware and OpenStack) or in the public cloud (like AWS and Azure). With Infoblox’s License Mobility, you can choose to move a software license from a physical appliance to a virtual appliance or to an appliance in the public cloud, without any additional payment. Infoblox’s flexible licensing gives you a simpler migration path to virtual and cloud architectures, offers budget flexibility and helps align your procurement needs with your business imperatives. Our patented Grid technology empowers companies the world over with its simplified upgrades, centralized visibility, and real-time data sharing across distributed infrastructures. The advantages of the Grid have helped make Infoblox a trusted brand and industry leader with nearly 50% of the market share for DNS, DHCP, and IP address management (aka DDI) and growing.